UNCASVILLE, CONN. – May 31, 2017 – An incredible lineup of classic and late-model Ford Mustangs are making their way to Barrett-Jackson’s 2nd Annual Northeast Auction at Mohegan Sun in Connecticut, June 21-24, 2017. Among the hotly anticipated Mustangs coming to The World’s Greatest Collector Car Auction® is an extremely rare Shelby GT350-H Fastback (Lot #665.1) that is one of 999 Shelby GT350s built in 1966 and a freshly restored ’70 Mustang Boss 429 Fastback (Lot #650). 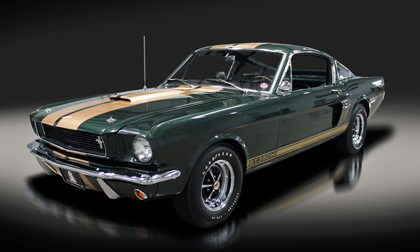 An extremely rare ’66 Shelby GT350-H Fastback (Lot #665.1) crossing the block at the Northeast Auction is one of only 59 finished in Ivy Green. Fully documented by the SAAC Registry, this Shelby fastback was completely restored in 2010 and retains almost all of the original sheet metal and framed fiberglass hood. It features a long list of original and correct components, including Ford Carlite glass, Hertz wheels and the restored Cobra Tach. The original matching-numbers Hi-Po 289ci engine was completely rebuilt and documentation includes the SAAC registry book, binder with records, owner’s manuals and Hertz brochure. With only 10 test miles since its rotisserie restoration, a Grabber Blue ’70 Boss 429 Fastback (Lot #650) features all-original panels and a 375-horsepower 429 Boss engine. It’s equipped with fiberglass belted tires, Drag Pack, convenience group and documentation that includes three copies of Ford Window Stickers and a Deluxe Marti Report. World Champion drifter Vaughn Gittin Jr. introduced a new generation of Mustangs to the world with the 2010 Ford Mustang RTR-C (Lot #658). Built as a halo car for the RTR brand, this Pony car is wrapped in a carbon-fiber exterior, which shed nearly 500 pounds from the factory version. It’s outfitted with Ford Racing’s supercharged 550-horsepower coupled with a 5-speed manual transmission. Riding on HRE CF40 carbon-fiber wheels, this one-of-one Mustang also features Ford Racing front and rear anti-roll bars, Autosport Dynamics rear control arms and TEIN in-car dampening adjustable coilovers. Mustangs from the ’60s in this year’s premier automotive lifestyle event at Mohegan Sun include a ’67 Custom Fastback (Lot #667). It features a rare Ford 427 FE side-oiler big-block engine connected to a C6 racing transmission and is loaded with high-performance components, including a MagnaFlow exhaust, sway bars and American Racing Shelby Cobra 18-inch rims with Nitto tires. Another ’67 Custom Fastback (Lot #747) started as a coupe and was finished in Pepper Grey Metallic.It comes equipped with unique Shelby badging, GT500 body and rocker striping, 17-inch Shelby-style alloy wheels and a Shelby-style wood steering wheel. A ’68 Custom Mustang Fastback (Lot #718) started as an original S-Code 390 GT big-block Fastback and was finished in an “Eleanor” body kit. It is a zero-mile restoration muscle car and is powered by a professionally rebuilt 390ci V8 with GT heads, GT exhaust manifolds and GT intake.